PACIFIC OCEAN – Carrier Strike Group (CSG) 11 is currently undergoing their final pre-deployment assessment, Composite Training Unit Exercise (COMPTUEX), marking the completion of their condensed Inter-Deployment Training Cycle (IDTC) for an upcoming deployment slated for this year. The aircraft carrier USS Nimitz (CVN 68) completed a nearly two-year yard period at the Puget Sound Naval Shipyard in September of last year. Since then they have undergone sea trials, Tailored Ship’s Training Availability (TSTA) I, TSTA II, TSTA III, Final Evaluation Phase and the Board of Inspection and Survey. Nimitz has been joined by the rest of her strike group for the first time since its previous 2013 deployment, to conduct the COMPTUEX, which is the 7th and final part of the ship, her crew and the strike group’s training cycle. COMPTUEX is an exercise that tests a strike group’s ability to work and operate as one cohesive unit in a simulated real-world scenario based training environment. Teamwork is essential with a deployment just over the horizon. Although Nimitz acts as the central hub for CSG 11, the ship relies on the entire strike group, to include Destroyer Squadron (DESRON) 9 and Carrier Air Wing (CVW) 11, to prove their operational capabilities prior to deploying. Nimitz was joined by multiple squadrons of CVW 11 during sea trials in October of last year to gain experience and alleviate some of the stress that integrating a full strike group for the first time can bring, especially in a condensed timeline like the one Nimitz and CSG 11 are experiencing. 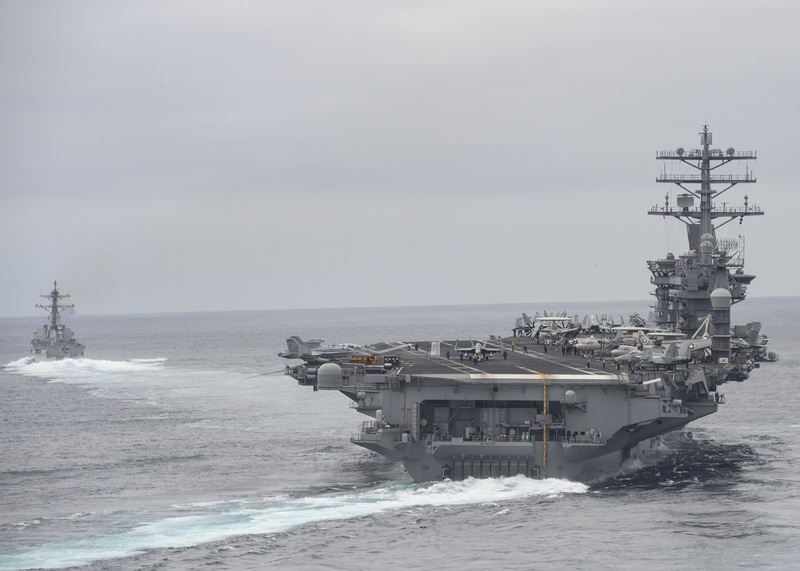 COMPTUEX is the first time that the rest of CVW 11 and DESRON 9 have operated alongside Nimitz. CVW 11 includes the “Argonauts” of Strike Fighter Squadron (VFA) 147, the “Black Knights” of VFA 154, the “Blue Diamonds” of VFA 146, the “Death Rattlers” of Marine Fighter Attack Squadron (VMFA) 323, the “Gray Wolves” of Electronic Attack Squadron (VAQ) 142, the “Blue Tails” of Carrier Airborne Early Warning Squadron (VAW) 121, the “Eightballers” of Helicopter Sea Combat Squadron (HSC) 8, the “Wolfpack” of Helicopter Maritime Strike Squadron (HSM) 75 and the “Providers” of Fleet Logistics Support Squadron (VRC) 30. DESRON 9 is comprised of the Arleigh Burke-class guided-missile destroyers USS Hopper (DDG 70), USS Howard (DDG 83), USS Shoup (DDG 86), USS Chafee (DDG 90), USS Pinckney (DDG 91), USS Kidd (DDG 100), and the Ticonderoga-class guided-missile cruisers USS Princeton (CG 59) and USS Lake Erie (CG 70). During the exercise, the strike group encounters an environment that mirrors, as closely as possible, what they may encounter while deployed in future areas of operation. They are given operational scenarios and must respond accordingly. COMPTUEX is normally designed to be broken up into two separate phases. Phase I closely follows a schedule of events (SOE) that acts as a training phase for Sailors and watchstanders. They know what to expect and when it is coming. This phase allows them to get an initial look at operational requirements and how the strike group functions together in various scenarios. Phase II provides the strike group with a scenario that doesn’t follow an SOE. The strike group must respond to the best of their ability without knowing what to expect. This phase is intended to overwhelm the Sailors and give them the closest experience to a real-world scenario that training can provide. COMPTUEX not only prepares the individual ships of CSG 11 to operate as a unit, but also gives them insight into operating with forces outside of their strike group. While the initial phase of COMPTUEX is meant to allow Sailors to gain experience and ease into the high stress environment with the guidance of CSG 15, Myers and other Sailors from CSG 15 act as the grading entity and will ultimately decide if CSG 11 is prepared to deploy. Not only are Sailors throughout the Strike Group getting an invaluable opportunity to train together, the team hosted Commander, Carrier Strike Group (CSG 12) Rear Adm. Kent Whalen, who came onboard during Phase II to observe the exercise and better prepare his team when the time comes to train. It will be up to CSG 11 to come together in a coordinated effort to perform and carry-out specific objectives to prove that they are deployable. Sailors aboard Nimitz have continuously shown their ability to succeed despite being met with an expedited workup cycle. While COMPTUEX is not yet over, Nimitz is continuing to show their ability to perform in stressful situations.